Power outage in Queens, New York during Hurricane Sandy on Nov. 11, 2012. America's electric grid is made up of more than 450,000 miles of high-voltage transmission lines that supply more than 140 million customers with electricity. That's nearly twice the distance between the earth and the moon (which is 238,000 miles). In fact, blackouts, or power outages, occur all the time. Usually, they're manageable and get resolved quickly. However, there have been instances where a quick fix wasn't possible. Homes and businesses have gone without power for half a day to 10 days and methods of transportation and communication have failed, in addition to more sweeping consequences. 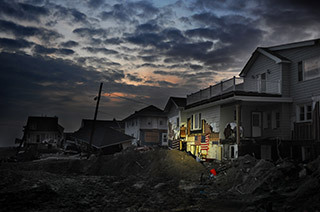 At times, the U.S. economy has even suffered due to a significant blackout event – such as the power outage that followed Hurricane Sandy in 2012. Financial markets shut down on Monday, Oct. 29, 2012, citing concerns about their ability to function without disruption. The New York Stock Exchange, the Nasdaq, and the CME Group in Chicago all suspended trading that day. On Nov. 9, 1965, one of the worst blackouts in U.S. history occurred when all of New York State and portions of seven neighboring states and eastern Canada were plunged into darkness. What was later dubbed "The Great Northeast Blackout" began at the height of rush hour. Millions of commuters returning home from work were delayed, and 800,000 people in New York's subway system totally trapped. Thousands more were left stranded in office buildings, elevators, and trains. 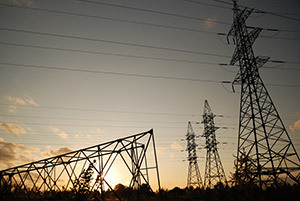 The blackout was caused when a 230-kilovolt transmission line near Ontario, Canada, was tripped at 5:16 p.m. This resulted in several other heavily loaded lines to fail. New York City was completely dark by 5:27 p.m. Altogether, 30 million people were affected by the blackout. Power was gradually restored to the affected areas through the night. By morning, the lights were back on everywhere. On July 13, 1977, a lightning bolt caused a power outage at the Indian Point nuclear generating plant in New York City. The bolt tripped a line and rendered the plant inoperative while a second lightning strike caused two more transmission lines to shut down. Subsequent power surges, malfunctioning safety equipment, and human error left 9 million residents without electricity for nearly 24 hours. The power outage sparked mass looting across the city. Rioters destroyed approximately 1,600 stores while arsonists set more than 1,000 fires. It led to the city's biggest mass arrest in history — police took 3,776 people into custody. On Dec. 22, 1982, more than 5 million people lost power after hurricane-force winds knocked over a major 500-kilovolt transmission tower in Tracy, Calif. More than 2 million homes and businesses in California, Nevada, and Arizona were left without electricity for at least a day. Disneyland was evacuated and the Las Vegas Strip went dark for more an hour. It turns out the falling 500-kilovolt line tower started a domino effect. It fell into a parallel tower. After that, the electrical failure mechanically cascaded and caused three additional towers to fail on each line. Initially, Canadian Defense Minister John McCallum blamed the incident on an outage at a nuclear power plant in Pennsylvania. But plant representatives countered, "Nope, wasn't us." What really happened was a high-voltage power line in Northern Ohio brushed against a cache of overgrown trees, causing it to shut down. An alarm system that would typically alert first-responding technicians failed, and so the incident was ignored. For 90 minutes, system operators tried to figure out what exactly was going. Meanwhile, three other lines switched off as a consequence of the first line's failure. As technicians panicked, Cleveland and Detroit went dark. So did Toronto and sections of New Jersey, Pennsylvania, Connecticut, and Massachusetts. Officials in New York City opted to shut off all power to head off a wider blackout. Eleven people died as the result of this blackout. Emergency rooms across the affected areas were flooded with patients with heat and heart ailments. Several people were reportedly hit by cars because traffic lights were out. 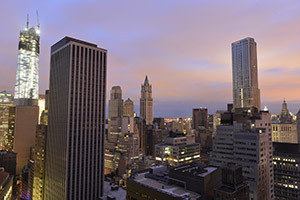 Sunset in New York City just after the derecho passed in June 2012. On June 29, 2012, the Mid-Atlantic and Midwest fell victim to one of the deadliest, fastest-moving severe thunderstorms in U.S. history – a progressive derecho. Derechos are straight-lined, land-based wind storms that can leave massive damage in their wake. The real problem is, a derecho often produces more natural disasters: tornadoes, flash floods, hurricane-force winds, and heavy rains. And the 2012 derecho caused the largest non-hurricane blackout in U.S. history. What punctuated the devastating effects of this thunderstorm was its arrival in the midst of a heat wave. At least 4 million people across 11 states and the District of Columbia lost power. In some areas, power restoration took from 7 to 10 days. Twenty-two people died. Just look at what's happening right now in Venezuela. A drought that has depleted hydropower reservoirs, along with failed policies and corruption, has forced the country to endure rolling blackouts to preserve electricity. In other words, the Venezuelan government has effectively pulled the plug on its own economy. Businesses, factories, and even hospitals have been shuttered. State workers have been forced to accept two-day work weeks. All of this could have been avoided – and certainly can be in the future – if just 16% of the entire world's electricity was unplugged indefinitely….